Edward Beard Budding invented the lawn mower in 1830. Early machines were cast-iron monstrosities mounted on heavy wheels and gear-driven mechanics to provide power. They operated manually and were most likely difficult to maneuver and push. Several improvements later, gas-powered mowers evolved. Motorized engines began to appear in the 1890s and vastly improved the amount of muscle power needed to operate the machines. Electric-powered lawn mowers, developed in the 1930s, did not catch on until much later. The first lawn mowers were reel or cylinder powered. They required large engines and were difficult to use. The development of smaller engines brought about the rotary mower, which required less power. In the 1930s, a farmer named C.C. Stacy began to experiment with the rotary concept. He created a suspension system for the blade that would allow his electric-powered machine to cut uniformly across the whole lawn. Unfortunately, he did not patent his invention, and his methods did not enter production until many years later. Electric lawn mowers are arguably quieter and more efficient than gas-powered machines. You can hear the volume of a gas-powered machine down the block, but the electric models are barely audible when you stand right next to them. Electric mowers have fewer moving parts than their gas-powered counterparts, making them lighter and easier to maneuver. The electric mower also features ease of use. you have no oil to check or gas to fill; just plug in and go. You push a button instead of fighting with the starter pulley. These mowers run for pennies a day and create none of the emissions the gas models put out. These mowers also feature a "dead man's button," a fail-safe in case the operator becomes incapacitated in any way. The oil embargoes of the 1970s have taught us that oil is a finite resource. Difficulties in the Middle East, a major U.S. oil supplier, have raised awareness of the costs—both monetary and societal—of relying on fossil fuels. Pollution reduction (both noise and emissions) has remained hot-bed topic for decades, and humans have attempted to find a way to reduce their carbon footprint but maintain all the advantages offered by gas-powered conveniences. According to Treehugger, a gas-powered mower produces as much pollution as 43 late Model T cars. Electric mowers produce significantly less. 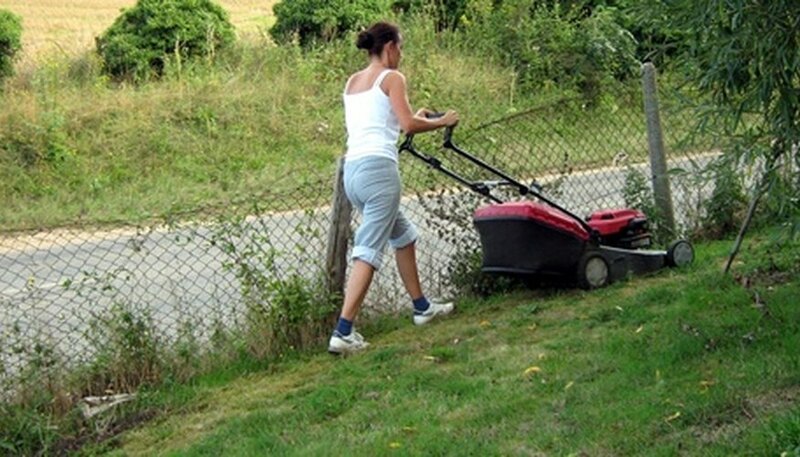 The electric mower has few disadvantages, but it does require a cord and an electric outlet. The cords may have to be quite long and unwieldy for large lawns, or you will need multiple outlets on the property. Mowers with rechargeable batteries can run down and require a long period to recharge. Some danger of electric shock exists. Additionally, if your only concern is saving the environment, purchasing a push mower is often cheaper than buying the electric mower. You can find a push mower at a garage sale and easily maintain it yourself with a blade sharpener and some lubricating oil. Just as the reel mower was the inspiration for the rotary mower, the electric mower is inspiring a new direction of lawn care. Though here to stay, the electric engine has led to the invention of cordless battery-powered models with batteries. Hovering mowers are mostly electric and provide air to give lift to the machine, sending it floating over the grass with the rotary blades working. Robotic mowers rely on wire around the lawn to border it and tell it where to mow. These models, which can use to mow large areas, are increasingly sold as self-docking, meaning they find their own way to their charging station. Robotic mowers are eliminating the need for any human power when mowing the lawn. Where was the Polaroid Camera Invented?